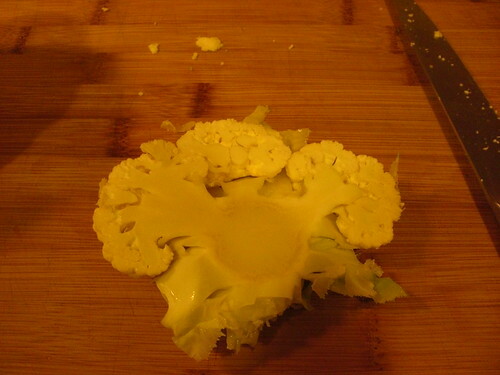 We got a cauliflower in our CSA box last week, and I used it to make Curried Cauliflower Soup. The recipe is from Vegetariantimes.com, provided to me by my buddy Sara of Stinkerpants. It was so delicious that, as I was waiting for Andy to come home for dinner, I licked my food processor blade to get every last drop. Wouldn't want to waste any of that yumminess! I'm usually scared to make soup because the seasoning can be so hit or miss, but this recipe didn't require any tinkering. Score! 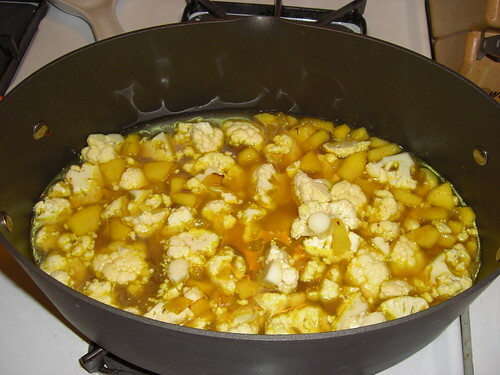 The only thing I changed from the recipe was that I used fat-free chicken broth instead of veggie. Vegetarian Times Issue: January 1, 2009 p.43 This soup’s secret ingredient—an apple—lends a touch of tangy sweetness that complements the curry’s spice. Letting the soup cool 20 minutes before blending helps deepen the flavors. I've always been a bit threatened by making soup...this sounds delish though! I think I just need to jump in and give it a try. 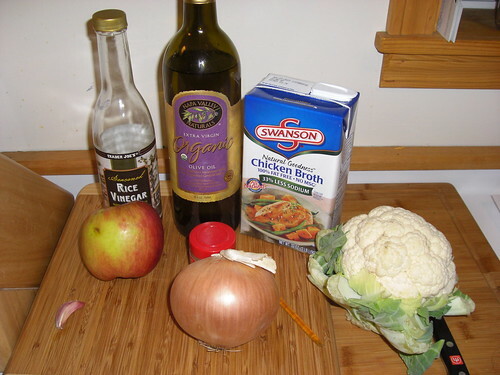 This recipe sounds lovely & I can always use something healthy in my life, haha! Mmm, I just made this* and it's delicious! 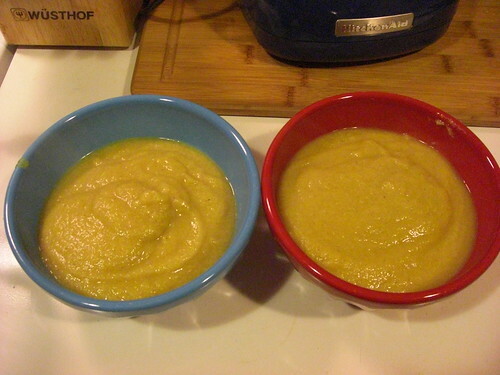 I love pureed soups, especially on cool and damp days like the one we're having today. Can't wait to take the leftovers for my lunch tomorrow! * Okay, being the dunderhead that I am, I forgot to get an apple at the store. So I used a potato and a glug of this great sweet-tart apple cider vinegar reduction that I have, and hopefully it came out about right.